Contributing Editor: Philippe Chappatte of Slaughter and May. The Legal Brexit guide provides expert legal commentary on the impact of the UK’s vote to leave the European Union. The guide analyses the potential impact in the most significant areas of law. Slaughter and May is a leading international law firm with a worldwide corporate, commercial and financing practice. In total the firm has: 99 partners in London, three in Brussels, 11 in Hong Kong, one in Beijing, and 440 other lawyers across the four offices, including: 9 corporate partners (and 133 other corporate lawyers) and 19 finance partners (and 80 other finance lawyers), although there is some crossover between these practice areas given the nature of the firm; 13 partners and 59 other lawyers in the firm’s dispute resolution department; ten partners and 63 other lawyers in the firm’s competition and regulatory department; eight partners and 20 other lawyers in the firm’s tax department; four partners and 17 other lawyers in the firm’s IP/IT department; four partners and 29 other lawyers in the firm’s pensions and employment department; and three partners and 23 other lawyers in the firm’s real estate department; three partners and 12 other lawyers in the firm’s financial regulation department. The firm’s multi-disciplinary approach means its lawyers offer a broad and deep understanding of many legal areas. The firm provides incisive advice whilst ensuring real value for money, and a professional service of the highest calibre. Slaughter and May is recognised throughout the business and legal community for its ability to help its clients realise and develop commercial opportunities, no matter how challenging the setting. The firm prides itself on being different. A client-focused approach means that clients are central to its culture; and a multi-disciplinary philosophy ensures that lawyers have a broad understanding of many legal areas and can offer not only depth of expertise but also breadth of experience and sound commercial judgement. The firm’s clients range from governments to entrepreneurs, from funds to leading banks, from retailers to entertainment companies and from industrial conglomerates to Premier League football clubs. It is a trusted adviser to the largest UK and global public companies and acts for more FTSE companies than any other law firm, by some margin. During the UK’s 43 years as a Member State of the European Union, its legal framework has been heavily influenced by the application of EU-derived legislation across a wide range of practice areas and industries. The UK’s decision to leave the EU is therefore likely to have far-reaching legal ramifications. Precisely how the UK’s legal framework will change to reflect the UK’s departure from the EU is, however, a matter of significant current uncertainty. The current legislative framework, highlighting those aspects for which EU-derived legislation is particularly important. The impact of the UK’s vote to leave in the transitional period ending with the UK’s formal exit from the EU, considering in particular the impact of the vote on current and short-term legislative developments and the wider legal environment. The impact of the UK’s vote to leave on the UK’s legislative framework, by reference to different post-Brexit scenarios. UK legislation has, during the UK’s membership of the EU, incorporated a vast amount of EU-derived legislation, covering a wide range of practice areas and industries. Indeed, EU legislation forms a core part of the applicable legal framework in most practice areas. Notably, in practice areas with a specific banking and financial focus (in particular banking and finance, capital markets, financial services, investment funds and insurance), a core aspect of the current legal framework in the UK is the importance of the passporting regime, whereby UK-based firms which comply with particular EU-derived requirements are then able to access markets in other EU Member States (and vice versa). See furtherthe chaptersonbanking and finance, capital markets, financial services, investment funds and insurance for more. In UK aviation law, UK airlines rely on EU-derived traffic rights to fly freely to non-UK EU destinations, and virtually all consumer protection regulation binding UK airline operations is based upon or derives directly from EU regulations. See further the chapteron aviation. In UK competition law, the application of merger control and antitrust derives from EU law and must take into account ongoing developments at the EU level. See further the chapteron competition. In employment law, the UK has introduced a number of core legal requirements (such as those stemming from the Transfer of Undertakings (Protection of Employment) Regulations 2006 and the Working Time Regulations 1998) which, as the chapteron Employmentnotes, may not have come into existence in the UK were it not for EU membership. Even for those practice areas and industries – such as family and matrimonial law (see the chapteron Family and Matrimonial Law), and the construction sector (see the chapter on Construction) – that have legal frameworks more heavily reliant on wholly domestic legislation and that therefore reflect EU law to a lesser extent, EU legislation still has a material effect on the rights and obligations of relevant parties, for example in family law, EU legislation addresses various jurisdictional issues flowing from the principle of intra-EU free movement of people, whilst the UK’s procurement regime is heavily influenced by EU legislation (and, likewise, EU legislation dictates the ability of UK companies to bid for public construction work in the EU). The exception to this general rule is the oil and gas industry, where a mixture of domestic legislation and international agreements provides the relevant legislative framework, with EU-derived law playing little part (see the chapter on Energy and Natural Resources: Oil and Gas). 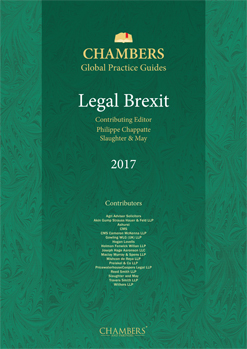 In the near term – before the UK has formally left the EU – the current legal framework will essentially remain in place for all areas considered in this publication. However, this interim period is likely to cause some uncertainty in the legal environment, as Government, businesses and practitioners look to adjust following the Brexit vote. For example, a number of pieces of EU legislation are due to be transposed into UK law in the short term, such as the General Data Protection Regulation (in May 2018 – see the chapter on Data Protection and Information), an update to the Insurance Mediation Directive (by February 2018 – see the chapter on insurance) and the Damages Directive (by December 2016). It remains to be seen whether the UK government will adopt all of these relevant pieces of pipeline EU legislation in the timetable envisaged or whether, in the light of the UK’s impending exit from the EU, it will re-consider whether and in what form to do so (for example, as the chapter on Technology points out in respect of the General Data Protection Regulation, the UK may consider it unjustifiably onerous to enforce compliance with a regulation that may only be in place for a short period before the UK formally leaves the EU). More generally, it is possible that UK regulators will, in particular as the exit model develops and starts to crystallise, start to shift their policy approach to reflect the post-exit position more closely (whilst remaining in line with the UK’s continuing legal obligations as an EU Member State). Further uncertainty is created by the duration of this interim period. At the time of writing, when and how the Government will trigger Article 50 in order to start the UK’s formal exit negotiations with the EU remains unclear. At this stage, we do not yet know to what extent parliament will be involved in the decision to trigger Article 50, or exactly who within the UK government and other political parties (eg the Opposition and representatives of devolved parliaments) will be involved in the negotiation process. Indeed, there are a number of separate – but linked – legal proceedings aimed at clarifying this issue (the claimants in each of which all essentially contend that, as a matter of UK constitutional law, Article 50 cannot be triggered by the UK without an Act of Parliament). What is clear is that this interim period provides an opportunity for practitioners and businesses to lobby Government and other relevant stakeholders. Indeed, recent announcements from Government ministers suggest that there is a desire on the Government’s part to canvass opinion from business and other interested parties on the form of Brexit and other relevant issues – for example, the Select Committee on Energy and Climate Change has specifically requested views on the impact of Brexit on UK environmental policy (see further the chapter on Environment). In the coming months, businesses and practitioners are therefore likely to be engaging with Government – both proactively and in response to formal consultation – to put forward their views as to the UK’s conduct during the transitional period and the most appropriate future model for the UK’s relationship with the EU. At the time of writing, there remains significant uncertainty as to the precise form of the UK’s post-exit relationship with the EU. The nature of this relationship will have a fundamental impact on UK legislation across practice areas and industries. If the UK joins the EEA, the resulting legislative changes are likely to be less significant than where other models are adopted. Indeed, under an EEA model the general rule is that the legal landscape will be largely unchanged, since the UK would, by virtue of EEA membership, continue to recognise multiple areas of EU legislation, including those relating to freedom of movement of people, capital, goods and services. This would mean that, for example, UK firms would most likely continue to benefit from 'passporting' rights in respect of Banking, Finance, Insurance and Financial Services (see chapters on banking and finance, insurance and financial services) and that, subject to any derogations specifically negotiated by the UK, EU migration policy would remain unchanged. However, the EEA agreement does not apply to all policy areas – for example, it does not apply to agriculture, meaning that under the EEA model the UK would no longer receive funding under the Common Agricultural Policy (seefurtherthe chapter on Agriculture and Rural Affairs). Moreover, whilst the EEA model preserves in large part the legal framework of essentially all the practice areas considered in this publication, the ability of the UK to influence EU law and policy would be severely curtailed. In particular, the UK would lose any formal ability to influence the passage of law in the EU. For example, the UK would no longer have a veto right over EU regulations it has traditionally opposed, meaning that it would be forced to accept EU legislation which it previously could have vetoed or has in fact opposed (for example, see the chapter on Family and Matrimonial Law). It would be a matter for negotiation between the UK and the EU as to the extent to which UK companies and financial institutions retain their passporting rights in the EU (see chapters on Banking and Finance, Insurance and Financial Services). In this respect, it is noteworthy that, at present, 'passporting' rights are not included in any free trade agreement to which the EU is a party. Any such negotiation is likely to be lengthy and complex. Aviation regulation would require a significant amount of renegotiation (for example, traffic rights between the UK and each remaining Member State would need to be bilaterally negotiated, and the UK Civil Aviation Authority would need to fulfil additional responsibilities currently assumed by the European Aviation Safety Authority, the UK’s membership of which would lapse). See further the chapter on Aviation. Immigration laws – particularly those that recognise the free movement of people within the EU – would need to be substantially overhauled (see the chapter on immigration). Whilst the legal effect of such changes will be largely restricted to immigration-specific legislation rather than the law of other practice areas, the commercial and economic effect of such changes will be widely felt across many practice areas and industries. Domestically, the cutting of ties with the EU (including its jurisprudence) could also result in a shift in the UK’s domestic policy (and thus changes in UK legislation) in some practice areas. For example, as explained inthechapter on Employment, the UK government could amend various pieces of legislation that stem from and are supported by EU jurisprudence. Similarly, in the field of telecommunications (see the chapter on Telecommunications), it is unclear what the UK’s policy agenda – and thus the legislative effect – will be in respect of mobile roaming rates and users' rights relating to electronic communications networks, both of which are issues that the EU’s net neutrality and roaming regulations directly address (or will address), but which are not covered currently by UK domestic law. The effect will be to introduce uncertainty as to the recognition of UK legal orders in the EU, and vice versa (see, for example, the chapter in respect of Family and Matrimonial Law). As explained in the chapter on Intellectual Property, it is unclear whether the UK’s intellectual property regime would continue to recognise the EU’s trade marks and designs regimes (if such recognition continued, this could imply a continued recognition of EU jurisprudence, which may be politically unpalatable). In corporate tax (see the chapter on Corporate Tax), there may be a detrimental effect on the verification of correct VAT treatment (previously harmonised in the EU via information sharing mechanisms), and instances of double taxation (or no taxation) could increase. On a related point, the tax treatment of charitable donations (both into and from the UK) is similarly unclear – see the chapter on Charities. In the oil and gas sector, whilst as noted the current regime does not depend on EU-derived law to a material extent, the negotiated outcome on energy tariffs will have a crucial impact on the development of the UK industry – see further the chapter on Energy and Natural Resources: Oil and Gas. Whatever the post-exit model, it is likely that there will need to be a myriad of new legislation intended to reflect the fact that the UK will no longer be part of the EU. At a mechanical level, this would anyway require a repeal of the European Communities Act 1972 (in whole or in part) to be replaced with new statutory arrangements to deal with the fact that EU law no longer has the same operative effect in the UK. However, there is a wide range of other EU-derived legislative instruments currently in force in the UK which are afforded validity by the European Communities Act 1972, which will need to be assessed individually for repeal, amendment or retention. In practice, this means that some form of transitional arrangement is likely to be needed to allow current EU-derived laws to continue in force in the UK pending completion of that assessment. There are no simple answers to the effect of the Brexit vote. This publication makes clear that the vote – and the UK’s eventual departure from the EU – will impact different practice areas and industries in different ways, but that all practice areas and industries will feel the effect in one form or another. In particular, much will depend on the final form of the UK’s withdrawal agreement as well as its future relationship with the EU. In the period before the UK’s formal departure from the EU, we expect there to be a period of inevitable adjustment whilst the legal system absorbs the effect of the Brexit vote and looks to reflect the new reality even whilst the UK remains a part of the EU. Businesses and their advisers are also making adjustments to reflect the Brexit vote in their commercial operations and contractual arrangements. During this transitional period, business and practitioners will be making their opinions heard, whether in response to government consultation or proactively through public debate or other forms of media. It will therefore be important that business and practitioners start to formulate their preferred strategy for influencing negotiations, including by considering: (i) the precise outcome that is being sought by such engagement; (ii) with which governmental entities it would be most effective to engage, for example, the UK government (and, if so, which department), the UK parliament, EU institutions and/or other governmental entities; and (iii) when such engagement should take place to ensure maximum impact.